Issue 4 M E E T I N G S Planning Commission: October 27, December 5 Board of Zoning Appeals: October 6, November 3, December 1 Transportation Committee: October 26 - - - - - - - - - - - - - - - - - - - - - - - - Keep informed about what’s inside Community Development by subscribing for this newsletter ealerts at: http:// ealert.fauquiercounty.gov/ subscribe.asp INSIDE THIS ISSUE: Route 29—North Corridor 1 Fall Seeding 1 Home Occupation- Business Opal Service District— Part 2 2 2 Real Estate Online 2 Historical Corner 3 Population Change 2000– 2010 3 Happy Trails! 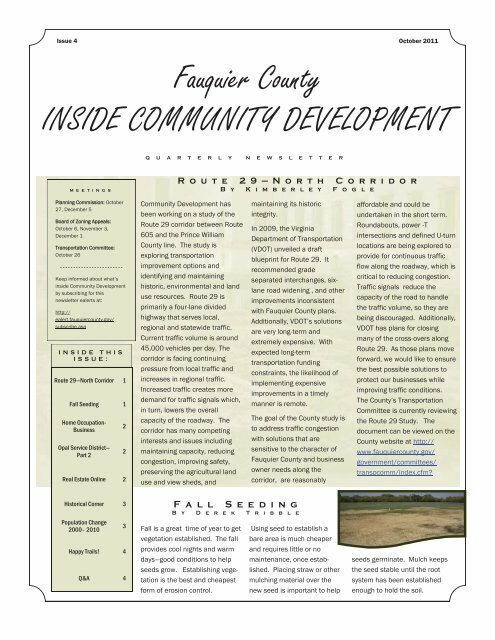 4 Q&A 4 Fauquier County INSIDE COMMUNITY DEVELOPMENT Q U A R T E R L Y N E W S L E T T E R R o u t e 2 9 — N o r t h C o r r i d o r B y K i m b e r l e y F o g l e Community Development has been working on a study of the Route 29 corridor between Route 605 and the Prince William County line. The study is exploring transportation improvement options and identifying and maintaining historic, environmental and land use resources. Route 29 is primarily a four-lane divided highway that serves local, regional and statewide traffic. Current traffic volume is around 45,000 vehicles per day. The corridor is facing continuing pressure from local traffic and increases in regional traffic. Increased traffic creates more demand for traffic signals which, in turn, lowers the overall capacity of the roadway. The corridor has many competing interests and issues including maintaining capacity, reducing congestion, improving safety, preserving the agricultural land use and view sheds, and maintaining its historic integrity. In 2009, the Virginia Department of Transportation (VDOT) unveiled a draft blueprint for Route 29. It recommended grade separated interchanges, sixlane road widening , and other improvements inconsistent with Fauquier County plans. Additionally, VDOT’s solutions are very long-term and extremely expensive. With expected long-term transportation funding constraints, the likelihood of implementing expensive improvements in a timely manner is remote. The goal of the County study is to address traffic congestion with solutions that are sensitive to the character of Fauquier County and business owner needs along the corridor, are reasonably Fall Seeding B y D e r e k T r i b b l e Fall is a great time of year to get vegetation established. The fall provides cool nights and warm days—good conditions to help seeds grow. Establishing vegetation is the best and cheapest form of erosion control. Using seed to establish a bare area is much cheaper and requires little or no maintenance, once established. Placing straw or other mulching material over the new seed is important to help October 2011 affordable and could be undertaken in the short term. Roundabouts, power -T intersections and defined U-turn locations are being explored to provide for continuous traffic flow along the roadway, which is critical to reducing congestion. Traffic signals reduce the capacity of the road to handle the traffic volume, so they are being discouraged. Additionally, VDOT has plans for closing many of the cross-overs along Route 29. As those plans move forward, we would like to ensure the best possible solutions to protect our businesses while improving traffic conditions. The County’s Transportation Committee is currently reviewing the Route 29 Study.  The document can be viewed on the County website at http:// www.fauquiercounty.gov/ government/committees/ transpcomm/index.cfm? seeds germinate. Mulch keeps the seed stable until the root system has been established enough to hold the soil.